SuperReceptionist is a personal reception hosted virtually in a cloud telephony environment. If you are using SuperReceptionist for your business, you can integrate it with Vtiger(cloud) to capture leads along with phone numbers directly from your Vtiger account. After you have successfully configured the Knowlarity gateway in Vtiger, you have to setup Vtiger details in Knowlarity account. Follow below steps to connect Knowlarity and Vtiger. Lastly, click Save to integrate. After registering with Knowlarity, you will be provided with a phone number, API key, and SR Number. Follow the following steps to configure these in Vtiger CRM. Select Knowlarity from the drop-down. Enter all the necessary details such as the API key and SR number provided by Knowlarity, callback URL, case/ticket and Opportunity merge tags. After you add all the details, click save. Select the status of the gateway as Active / Inactive. If active, you get the gateway prompted to select during a phone call. 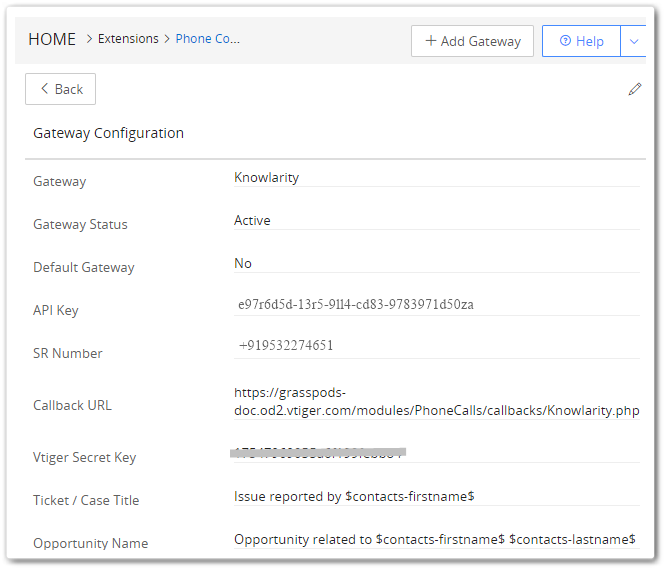 Mark the gateway as default to automatically make a call from Knowlarity. Enter the API Key provide by Knowlarity. You can find the API key in Settings > Call Flow > Plan Settings page. Add your SuperReceptionist phone number here. Unique key generated for authentication, which has to be configured in Knowlarity. 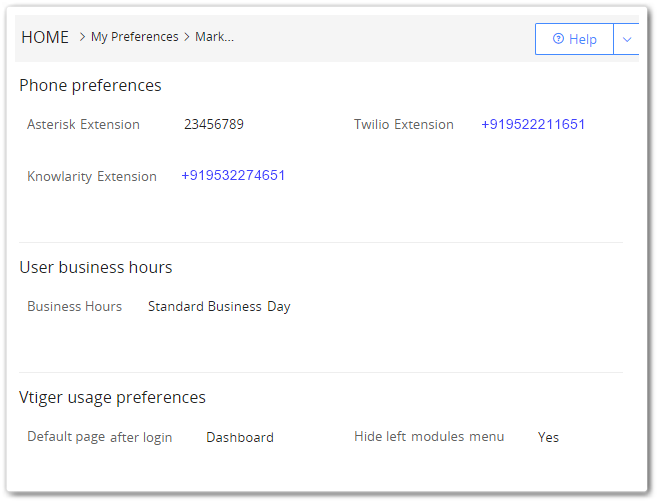 For each user who is allowed to handle incoming and outgoing calls from the CRM, the extension number should be configured in the User preferences page. Once the configuration is completed on both sides, i.e., Vtiger and Knowlarity, you are now ready to make and receive calls in the CRM.